The ‘Importing Spectrum Parameters’ feature will allow Mnova users to include any variable into the Parameters Table from the raw data file. 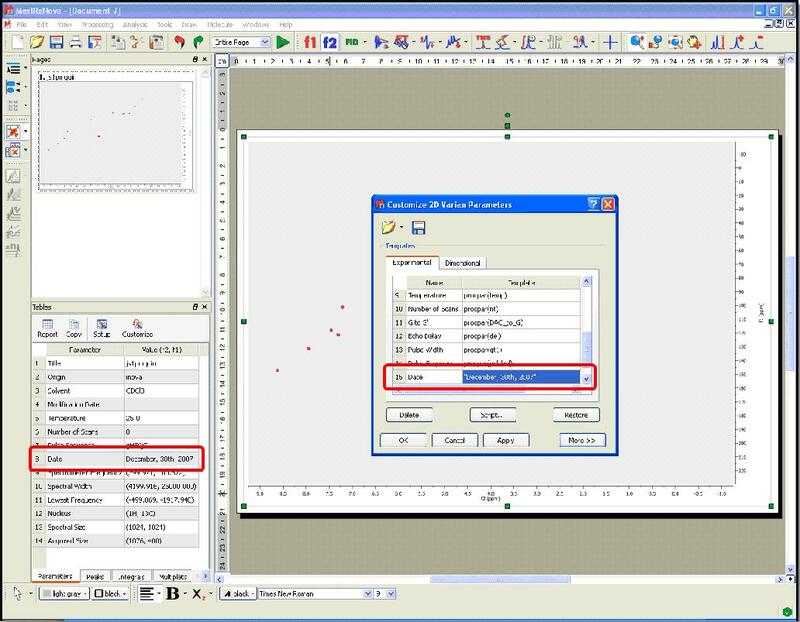 In addition, the users will be able to create ‘Parameters Templates’ in order to obtain the same parameters in all of their processed spectra. Before this feature was implemented, only standard spectrum parameters could be included in the corresponding table. 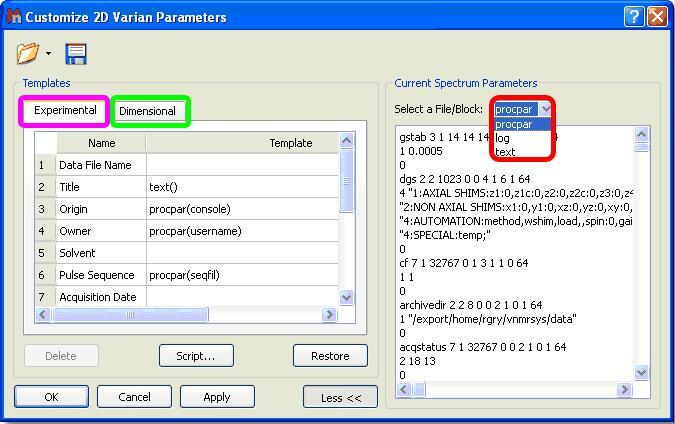 The user will easily be able to add, create, remove or modify any spectrum parameter or even to create templates in order to obtain the same parameters in any processed spectra. 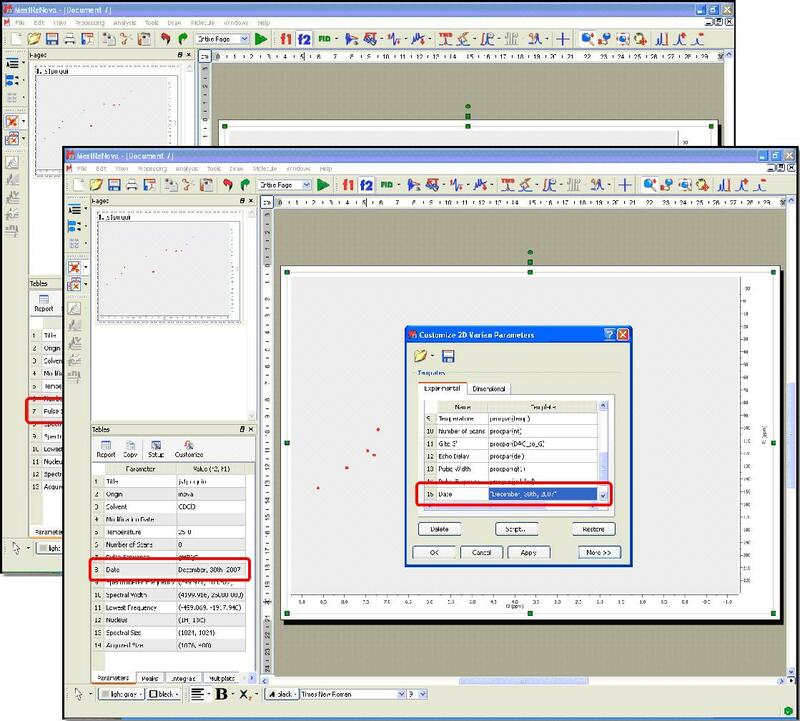 Customization of the parameters table is Mnova is very intuitive, just follow the menu: View/Tables/Parameters and click on the ‘Customize’ icon to display the ‘Customize Parameters’ dialog box. In the ‘Customize Parameters’ dialog box, the user will see an ‘Experimental Parameters Template’ (pink square in the picture above) which will be common for 1D and 2D (with information about: Title, Origin, Owner, Solvent, Temperature, etc.) and the ‘Dimensional Parameters Template’ (green square in the picture above) with information about the ‘Spectrometer Frequency’, ”Acquired Size’, ‘Spectral Width’, etc.). Both sections have blank rows in their last position to allow for addition of further parameters. 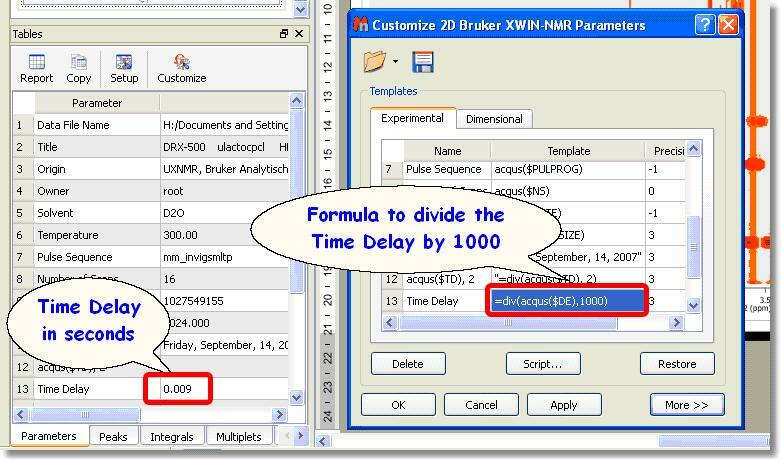 You can easily add any existing parameter from the raw data. 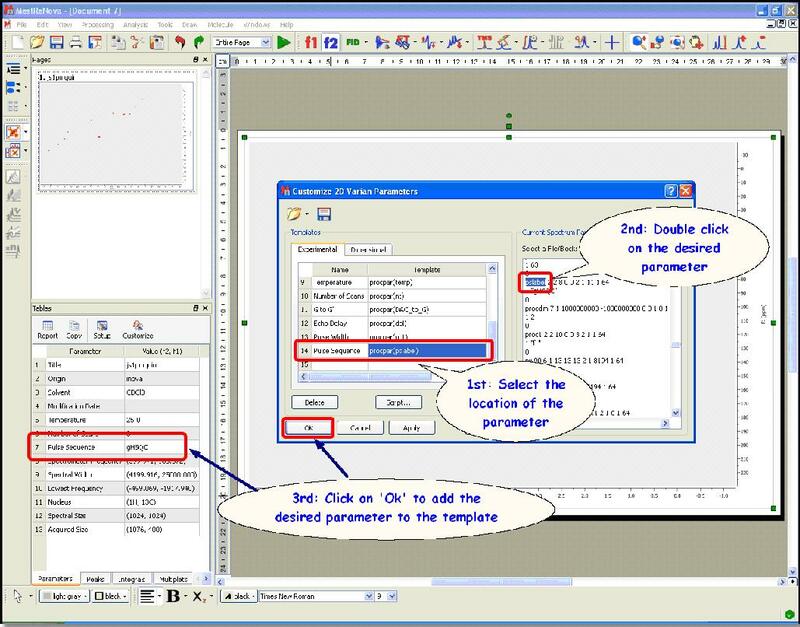 Start by selecting the location of the parameter in the Experimental or Dimensional Parameters Template by clicking on the relevant cell of the ‘Template’ column on the table. Once this has been selected, double click on the desired parameter (from the ‘Current Spectrum Parameters’ box). This will add the chosen parameter to the template. The user will also be able to introduce formulas (available in the script) by typing an equal symbol followed by the desired formula (numbers or parameters), for example: =sum(a, b), or =div(acqus($TD), 2). The parameters will be hidden in the table display if the user removes the corresponding tick mark on the ‘Visible’ Column. The user can also delete any parameters from the table by highlighting each of them and clicking on the ‘Delete’ button. The ‘Restore’ button is used to recover the default template. The user will be able to save his/her own template by clicking on the ‘Save Template’ icon . To load a template, just click on the ‘Open Template’ button . Clicking on ‘OK’ will save the template in the registry and Mnova will remember it for futures uses. 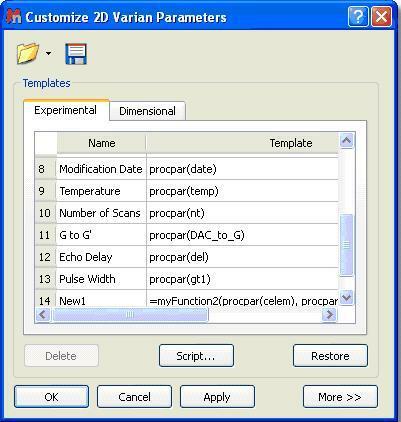 The ‘Apply’ button is used to view the effect of any changes directly on the parameters table without needing to close the ‘Customize Parameters’ dialog box. 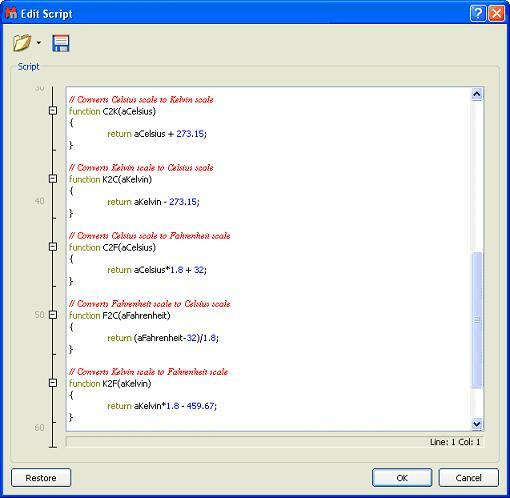 The user will be able to edit the ‘Parameters’ script by clicking on the ‘Script’ button . This will display the script with some functions (to sum, divide, convert Celsius to Kelvin or to Fahrenheit, etc.). 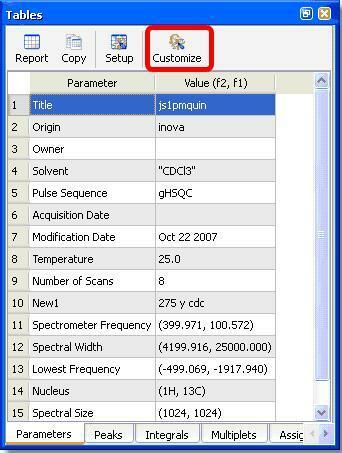 The Importing Spectrum Parameters feature was implemented to allow users to import any fields that exist in a raw data file in order to obtain a ‘Customizable Parameters Table’ to the user’s preferences.